A couple of days ago I wrote an introduction to using the new Timeline version of Lives of the First World War (LFWW). I said I'd come back and explain how to add External Evidence. 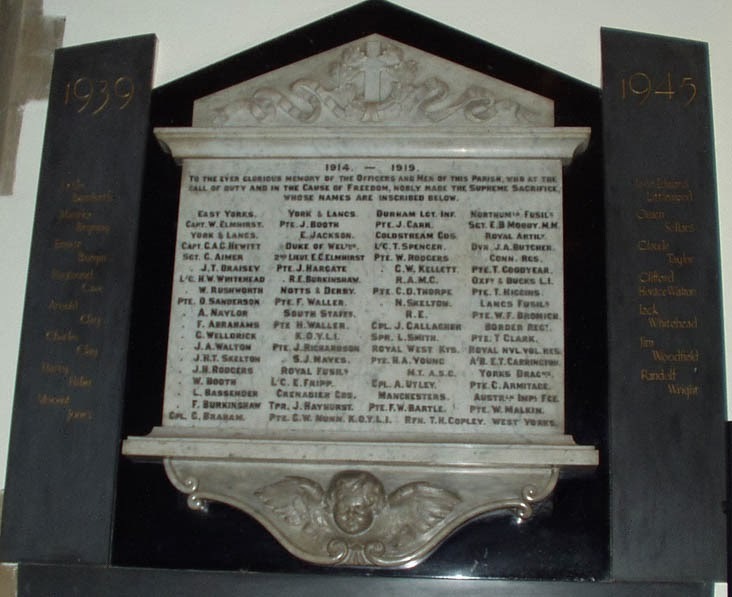 I've been adding men from the War Memorial at St Mary's Church, in Worsbrough Village near Barnsley to a Community on LFWW. I was intrigued by the name of one man - listed as Pte T Goodyear of the Conn Rgs on the memorial - the researcher who had submitted his list to me (AB) had written Goodyer? on his spreadsheet as if he wasn't sure about the spelling. I looked the soldier up on the Commonwealth War Graves Commission website and helpfully it gave his wife's name and their home address in Blacker Hill, Barnsley in the Additional Information, so I know I've got the right man. Now confirmed as Timothy Goodyer I decided to add his photo and obituary from the Barnsley Chronicle to LFWW. We did adding pictures in my last post, so this is about adding External Evidence in the form of a transcription of a newspaper cutting. From AB's research and the entry on the CWGC I know that Private Goodyer's service number is 3345. That and his surname are enough to find him on LFWW. I have already added his picture - quite a handsome chap don't you think? You can see in the highlighted oval "Evidence" that he currently has three pieces of evidence attached, these are the seed data - his Medal Index Card and his CWGC entry, both attached by the Imperial War Museum and the photo, attached by me. I am going to attach the Barnsley Chronicle as my other alter ego, my test user who hasn't got a paid subscription. Click on the Evidence button on the toolbar and the page display changes to the Evidence page. Scroll down past the orange Search Records button (that would have taken us to the records that mostly can't be viewed unless you have a paid subscription) to the green Add External Reference button. Click that. The External Reference Dialogue box opens. As you can see I have selected Book/Publication/Archive by clicking the 'radio button' by that phrase. The boxes below will change to suit each kind of evidence. I have entered 'Barnsley Chronicle' as the Title, and the date of the newspaper report in the Reference box. There is no particular way of doing this - but imagine that you are reading this on someone else's page - you would want to know where to find the report of Pte Goodyer's death. Location Accessed is Barnsley Archives - who have the entire newspaper available to search digitally - go and visit and have a look! It's very addictive! The Description should aim to be helpful to someone with poor eyesight who might be viewing this soldier's Life Story via special software that reads out text or to someone who isn't familiar with the source you are attaching. I haven't ticked the boxes at the bottom yet - but it will be Surname, Military Details and Place I think. His name is mentioned, his regiment and service number are in the report and it gives his home address as Blacker Hill which matches the CWGC entry beautifully. Then click Connect to *your soldier's name* and Continue on the Thank You pop up and you have added some External Evidence - Well Done! I am now going to add a transcription of the cutting as a Story linked to this Evidence - I could add the image of the cutting that I have, but as I want to persuade more people to go to Barnsley Archives and to look things up for themselves I'm being a bit stingy with uploading obituaries at the moment. Remember you should only upload images you own or have permission to use for this purpose. We are still on the Evidence page so scroll back down to your new entry - the title will be displayed above the green button we just used to add the Evidence. Click on the title of the evidence, in this case Barnsley Chronicle, and a new dialogue box opens. This displays the information I just added. You can see that this evidence was connected by Linda Test (the name I gave my non-subscription account). If you think someone else has added incorrect information to a soldier's Life Story you can click Challenge this source and submit a report saying why you think it is wrong. Remove evidence is self explanatory - evidence can only be removed by the person who added it by the way. I am going to add some free text, a transcription of the newspaper cutting, so I chose Add a story based on this. You can add a story using the Stories button on the tool bar without attaching any evidence - this is useful for family stories or rumours about the soldier. But in this instance I am making a direct transcription of the evidence I have in my hand and if someone wanted to see it for themselves they could go along to Barnsley Archives and look it up in the Barnsley Chronicle. I now have the Story Dialogue Box on screen. You can write whatever you want in here - up to the word limit in the Story box, but it is quite large at 5,000 characters. You can Share (that's the dark turquoise button at the bottom) at any point and come back and add (well they call it "improve") to the story later. I would actually recommend you do this a couple of time if you are typing a long piece especially if you are doing it on a phone or tablet because if your connection fails you will lose what you have written if you haven't saved (Shared) it. You could transcribe your cutting or write your story in another word processing document and then just cut and paste to here. That works just as well. Beware, if it won't let you save you may have exceeded the word limit and will need to edit a bit or split your story into two parts. I usually add the Location Barnsley, Yorkshire and the date of the newspaper that the cutting is out of in the bottom section of the box. Any story with a date is displayed in chronological order on the Timeline page - so this is a very useful tool. Note that you can use paragraph breaks in the text, they will display correctly on the Timeline page - the stories look a bit untidy on the Stories page, where the lines all run together, so for the best display always try to add a date so that the story displays on the Timeline. When you are ready click Share and Continue on the pop up Thank You box. Change your view to Timeline by clicking on that word on the tool bar just under the profile picture of your man and enjoy your addition to his Life Story. That's all for now - I think my tea is ready. Good Luck with your research and keep Remembering the men and women who served in the First World War - they deserve it!